Separation anxiety can be a big deal for toddlers and toddler parents and really impact your life when it hits in full force. Some toddlers skip this stage entirely, but most at least experience it a little bit. All three of my kids have gone through very intense stages between the ages of 15 months to 2.5 years old when they really only wanted me all the time and had a really hard time if someone else was watching them... include their dad, who they love. First off, you can read a bit more about separation anxiety at Help Guide. It is a totally normal stage of development and it usually fades as kids get older. Using some of the strategies I am sharing can help kids cope with any challenges. I typically breastfeed my kids exclusively during their first year. I've tried pumping and formula and my kids hate bottles, so they've mostly just gone everywhere with me until they are a year old... or I just never go anywhere. Once my kids are eating solid food and can go longer between meals then I typically start getting out a bit more for Girls Night Out, volunteering at my son's preschool, or just running errands by myself. Sometimes for these activities out I get a babysitter or friend to watch my kids and sometimes my husband watches them. Next week I will start up volunteering in my daughter's co-op preschool class so my toddler son is going to have a new childcare setting. 1. We display photos of babysitters or other adults that watch the child and talk about them often. This is sometimes as simple as showing a photo on our phones to the child daily. We've also created little photo books before to help the child talk about any new adults. Our photo garden can also be use for this purpose. 2. We very carefully choose babysitters/other adults to watch our children. We look for someone who is patient, calm, happy and that will use similar positive behavioral strategies that we do. We call references and go through a careful interviewing process to make sure the adult is a good fit for our entire family. 3. We are only gone for a short period of time at first. When we first leave the child we try and plan to be gone during their best parts of the day (after nap and meals or in the morning versus late afternoon when they are tired or more emotional). This way the child is able to have fun with the babysitter and have minimal grumpiness. We also start short... so we might only be gone for 30 minutes the first time... then increase to 45 and then one hour. I like to have the experience be a success and if I am gone too long the first few times it ends up being a big failure! 4. We warn the kids ahead of time that we will be leaving and then we let them know when we'll be back. Even with little ones who don't seem to understand, we still tell them. By being very clear about when we are returning and then making sure we are always on time (as best we can), the kids feel a little more relaxed and informed. 5. We make a list of favorite activities, foods, and materials for while we are gone and stick it up on the wall somewhere. I will often leave special craft projects or materials out that the kids have been enjoying or I'll leave a list of simple ideas the kids helped me brainstorm (building a fort, going on a bug hunt, or playing hide and seek... easy peasy). I especially like to highlight really engaging activities that the babysitter could try with the toddler right when I leave to help the child get excited about being with the new adult. 6. We encourage the other adult to comfort our child while we are gone and not to just say "You're OK" or You'll be fine." We remind them that it is OK to just let the child cry if needed for a little bit while they are trying to comfort them. I usually try and hand the child off to the new babysitter calmly and confidently and then I go. 7. We get everything ready ahead of time so that we are not lingering for too long once the other adult arrives or once the adult takes over. This way we aren't collecting items after we've said goodbyes and delaying leaving which just causes more anxiety and stress for the child. 8. 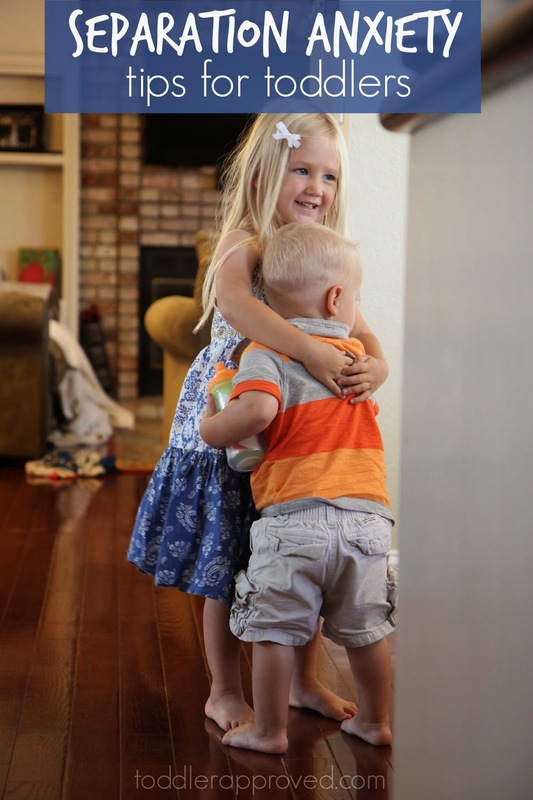 We get the child engaged in an interesting activity with the other adult/siblings, say goodbye in a confident way (don't sneak out), and then leave right away. I don't like to sneak out because it ends up making the child even more anxious since they are unsure when you are leaving. It is easiest to establish a time frame and drop off routine and stick with it. We try our hardest to stick with the schedule we set before we left home. By showing our kids that we are consistent and we will return when we said we would we are help building their trust. Sometimes things have to be adjusted when plans change or people run late, but overall we try to be on time. 10. We take things slow if we have the flexibility to do that. It is much easier to be flexible when I am just going out to run errands versus when I am desperately needed at my daughter's school and need the toddler to stay with the babysitter. I don't just give in and stay home because my child is having a hard time. Instead we may go out for less time, but we'll still go. I always check in with the babysitters while I am out and typically the anxiety is only during the first few minutes and then my toddler will snap out of it. When he was younger and could just cry for hours we would leave him in just 15 minute increments and then slowly increase the amount of time over time. It worked wonderfully! We used many of these tips above along with some of these Separation Anxiety tips from AHA Parenting and these tips for settling kids into childcare from Childhood 101. I'll be revisiting these lists over the weekend and next week as we prepare for my toddler's new childcare experience on Tuesday. Does your child have anxiety about preschool? Here are a few additional ideas to help kids with anxiety in preschool. I'd love to hear about your kids and separation anxiety? Do you have any additional tips for me? Have you tried any of our tips? Separation anxiety is a part of first-day blues and how a teacher handles it can have a huge effect on how a child will perceive school. It's like building trust between the child and teachers, as well as other students. I agree with your tips. These things can easily make a child feel at ease with the idea of going to school. This is very helpful. We actually lose a lot of parents throughout the year, as they get worried when their babies start to cry and can't separate. We know that it is something they have to go through but we also understand how difficult it is for a parent. While we may be experienced enough to deal with it, for them it is their first time. We have written a detailed blog post about separation. Would it be possible to share it with you? I have a granddaughter diagnosed with Severe Separation Anxiety as well as Sensory Processing Disorder. I have found that the fall back for many caregivers when they are frustrated or tired of hearing, "When will they (momma, nana, papa...) be back? Will you take good care of me?" is to tell her to go play or she is FINE. (said in a loud voice) This only makes the situation worse. I have the privilege of staying home with. We have scheduled play dates, karate classes, and daycare at a local gym (2 hour time limit and only if you are on the premises). These have all helped to get her to slowly overcome her fears. With some children, it is more than missing family, it is a diagnosis that has to be explained (in painful detail) and sometimes you can see the doubt creep into the teacher's/caregiver's eyes. That for me, is frustrating. A panel of specialists diagnosed her, not me.